Heraldic arms served a number of different functions in the late Middle Ages. They were decorative, of course, and they also became markers of aristocratic identity, so that a family’s hereditary right to arms might be jealously protected; the classic case is that of the Scrope-Grosvenor dispute of the 1380s, which is well known mostly because people like John of Gaunt, Owain Glyndŵr, and Geoffrey Chaucer (some of whom became famous afterwards) were called as witnesses. But one of the most important functions of heraldry was its role in battlefield communications. In the Harley Froissart miniature above, various units are mustered under the flags of their leaders. Some individuals carry shields blazoned with their arms, and we can expect many retainers to be wearing the liveries of their lords. Heraldry provided an easy visual means to organise a medieval army on the field. London, British Library MS Royal 14.E.iv, fol. 14v, detail. Image: British Library. In actual combat, communication between leaders and troops is a critical challenge and often very difficult to achieve. The rather nonchalant expressions on the faces of the men-at-arms in the picture above (London, British Library MS Royal 14.E.iv, fol. 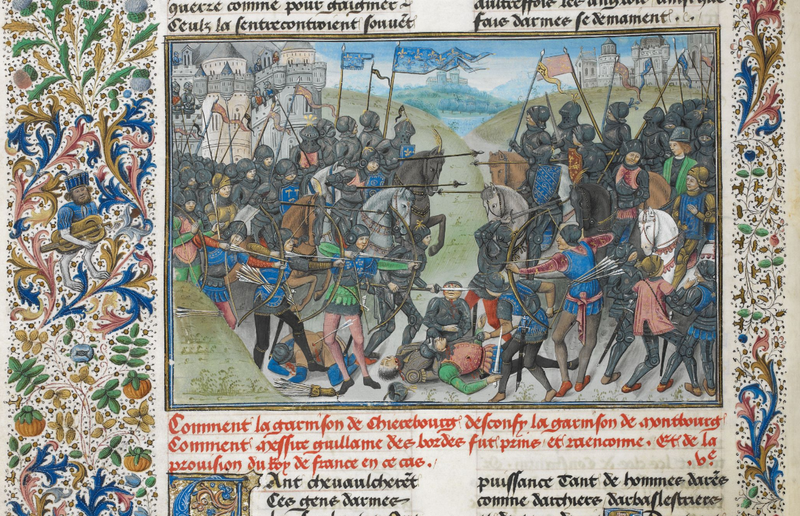 14v, miniature showing combat between the garrisons of Cherbourg and Montbourg, from the Chroniques of Jean de Wavrin) are misleading; no one looks that relaxed when sharp metal objects are coming towards you at high velocity. When you are a combatant on a medieval battlefield, how, in the noise and confusion, do you know where to ride (or run) or whom to hit? If you are a military leader, how do you tell your soldiers what to do? Obviously yelling a lot will have only limited effectiveness, although war-cries did indeed have tactical as well as psychological uses in battle. A common solution, practiced since Antiquity, was the deployment of battle standards. A flag on a pole – in most cases, a banner on a lance – raised above the heads of the fighting men, provided a rallying point for soldiers and a way for a commander to signal movement. A combatant could keep an eye on his flag, could follow it if it advanced or retreated, fight towards it if he found himself isolated from his unit, feel reassured when he saw it still flying, and run for the woods if it was cut down. In fact, one of the primary original meanings of Latin signum, which through French became the English word sign, was ‘a military standard or banner’. 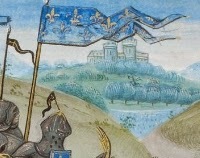 The Templar Rule specified that the lance to which a banner was attached could never be lowered to attack an enemy, since that motion would be misunderstood as a signal of defeat; and Templar knights were not permitted to leave a battlefield as long as their flags or those of their allies were still flying (Verbruggen 1997, p. 89). The semiotic system of heraldry appeared frequently in medieval books as well, and not only in pictures of battle scenes. Books or rolls of arms provided detailed illustrated lists of armorial devices with their owners. London, British Library MS Harley 4205, fol. 32v. Image: British Library. 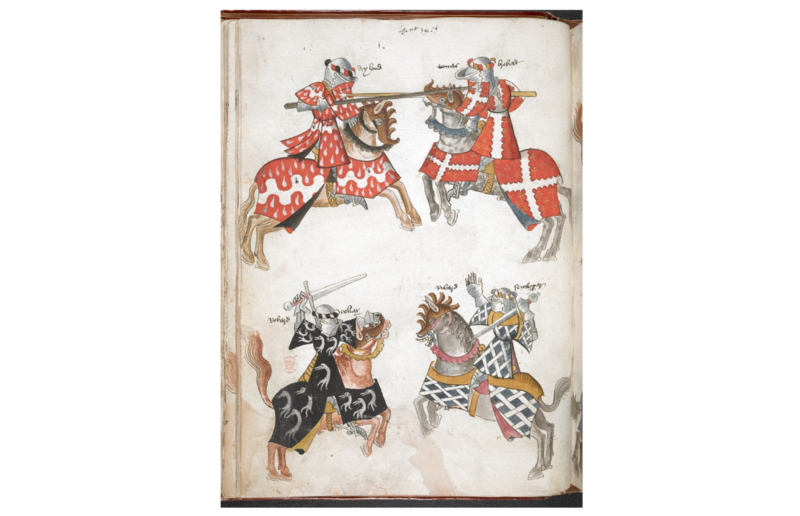 A late 15th-century example, Sir Thomas Holme’s Book of Arms, consists of page after page of stylised images of knights fighting each other tournament-style or holding battle standards, all practically identical except for their coats of arms. Heraldry was important in genealogies also; elsewhere I have written about the non-textual subtext of the English Rous Roll, in which the historical earls of Warwick were linked, narratively but also heraldically, with a legendary past. London, British Library MS Additional 18850, fol. 255v. Image: British Library. But heraldry might also appear in books that were not specifically heraldic in focus. 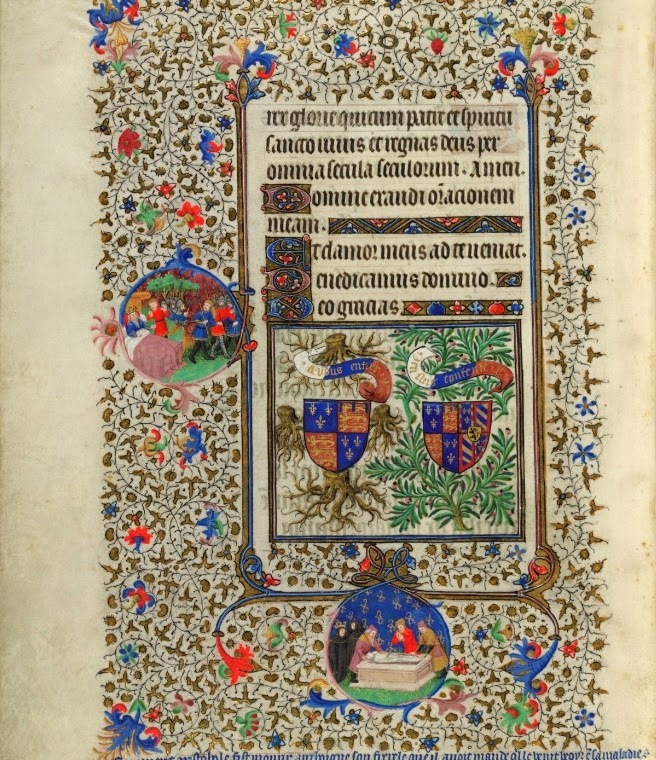 A aristocratic patron commissioning a richly decorated manuscript, such as a psalter or book of hours, might ensure that his or her personal arms were included in the decorations. Or, as in the case of the Bedford Hours (London, British Library MS Additional 18850), a later owner (John, Duke of Bedford), had an artist add his arms and those of his wife (Anne of Burgundy) whenever there was a convenient space at the end of a section. Especially intriguing is the visual indexing system developed by the 13th-century chronicler Matthew Paris for his historical works. London, British Library MS Royal 14.C.vii, fol. 85v, detail. Image: British Library. In this autograph manuscript (London, British Library MS Royal 14.C.vii) of his Historia Anglorum, for example, shields bearing coats of arms in the margins identify important historical figures in the text. Here, on fol. 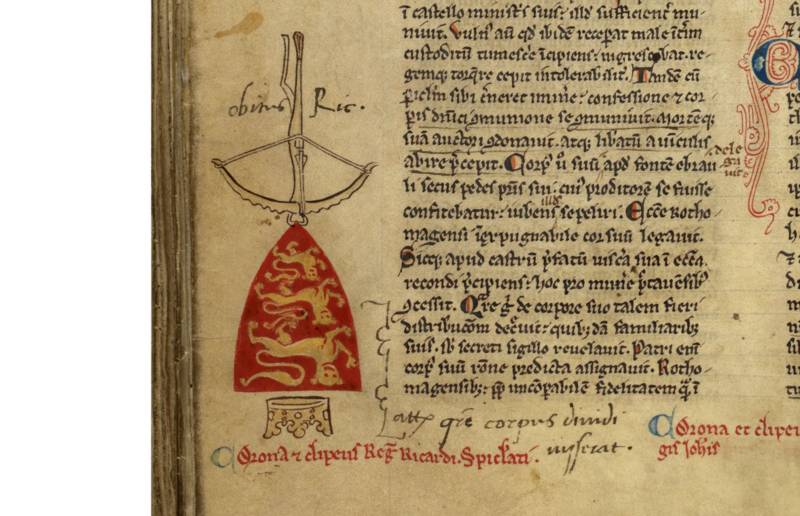 85v, a crossbow above the inverted royal arms of England indicates the death in 1199 of Richard I, who was shot in the shoulder by a crossbow bolt when besieging the castle of Châlus-Chabrol and died when the wound became infected. Heraldry continues today, of course, although many modern people probably regard it as no more than a decorative curiosity. It is useful to remember that it was important to medieval people in western Europe (at least to those who were noble or had an interest in nobility) because it was a versatile visual semiotic code that became a powerful means of communicating family history and individual identity. Liu, Yin. ‘Romances of Continuity in the English Rous Roll.’ Medieval Romance, Medieval Contexts. Ed. Rhiannon Purdie and Michael Cichon. Cambridge: D. S. Brewer, 2011. 149-159. Porter, Pamela. 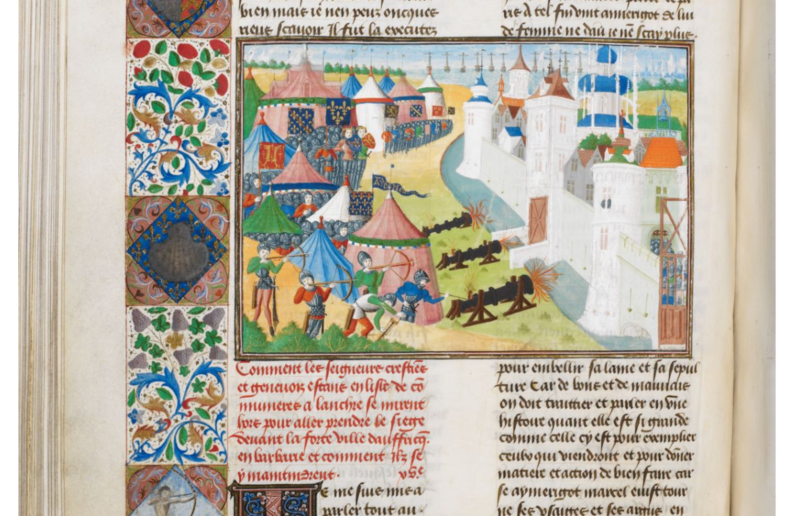 Medieval Warfare in Manuscripts. London: British Library, 2000. Wagner, Anthony Richard. A Catalogue of English Medieval Rolls of Arms. Aspilogia 1. London: Society of Antiquaries, 1950. Rpt. Woodbridge: Boydell P, 2009. Thanks to Danielle Grant for drawing my attention to Sir Thomas Holme’s Book of Arms. I don't know if you know about the curious heraldic details in the Bestiary manuscript, MS Bodley 764. On the Elephant page, what looks like a typical "war elephant scene" featured in other bestiaries, wherein two troops of knights are shown attacking each other, is peculiar because the emblems attached to the elephant's tower apparatus on its back are actually the heraldic ensigns of four Welsh marcher lords, I believe. Ronald Baxter has written an article on it called "A Baronial Bestiary: Heraldic Evidence for the Patronage of MS Bodley 764" (available via JSTOR)! It is the only bestiary manuscript which may tell us why it was made and for whom it was made. Exciting! Thanks very much for that tip. I'd not noticed the little shields on the Elephant image in MS Bodley 764, although I have Richard Barber's handy English translation on my shelf, with the pictures. Baxter's article includes some useful references to coats of arms in other MSS too, especially psalters and books of hours. If I may be forgiven for blowing my own horn a little bit, some of the most enjoyable heraldic detective work I've done was to track down the arms used by Richard Beauchamp, earl of Warwick, in his pas d'armes at Guines: see 'Richard Beauchamp and the Uses of Romance,' _Medium Ævum_ 74 (2005) 271-287.